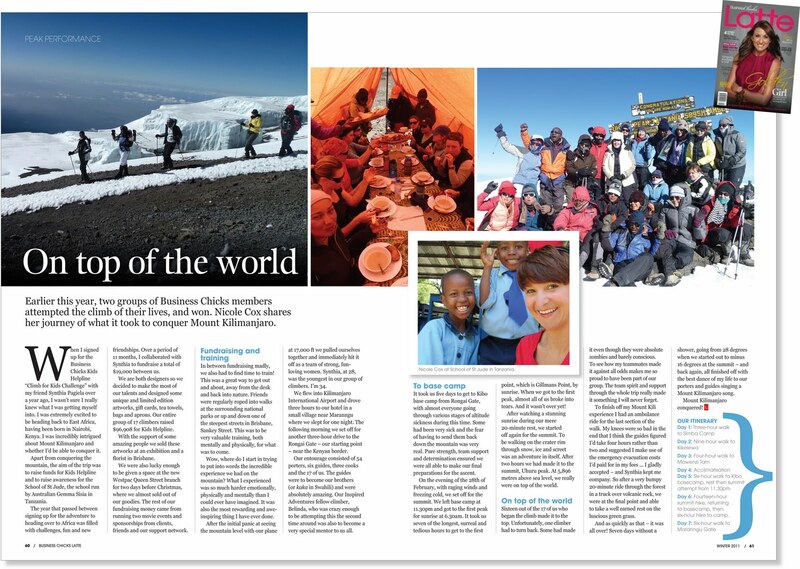 inspire by design: My Kili experience has been published in Latte Magazine..
My Kili experience has been published in Latte Magazine.. I received my copy of Latte Magazine today and am so excited to have had my experience of Mt Kilimanjaro and fundraising for Kids Helpline profiled in a double page spread. My fundraising buddy, fellow designer and climber extraordinaire, Synthia and I are both looking for the next charity challenge... in fact Synth has signed up to cycle through Cambodia to raise money to help create better lives for Girls in the Congo forced into Prostitution in Feb next year and I'll likely be doing something equally as exciting later in 2012... will keep you posted! There are a few people who were edited out of the article and I'd like to make a special mention about them... Inspired Adventures who were amazing in their support of us as well as Ugees owner Charlton who so wonderfully allowed us to hang our artworks in his cafe at west end for weeks and continued to support us through donating his tips! There are so many people who supported us, I hope you know how much we love you!!! For now, I hope you enjoy reading the article!